After careful watching of the forecast for the week we eventually left our offices for Henley Festival knowing we would have rain at some point. As we drove down the hill into Henley town and saw the flooded banks of the Thames we realised that instead of trainers we should have brought our wellies!!! It absolutely poured down all day and night however, in true British style, the wellington boots were donned over black tie and evening dress and the event went with a swing in the rain! Thursday however dawned with a blue sky and the evening was a great success in the Albert Roux Riverside Restaurant with guests utilising their private pen gardens for champagne and canapes before sitting down to a sumptuous dinner and copious amounts of wine. The Gipsy Kings were superb on stage and one of the best firework displays to date, finished off the entertainment outside. Inside the restaurant however, the Jazz band this year were on fire with a new young male lead singer who really got the dance floor full to capacity until the early hours. Friday was another wet afternoon however it stayed fine for the performance by Lesley Garrett and another lovely evening was had by all. 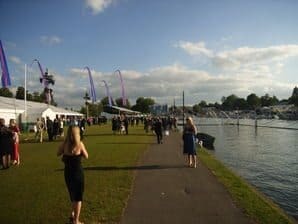 This was my first visit to Henley Festival being a new member of Team Tactics however it has now become my favourite event on the calendar. The atmosphere is totally unique due to the many different things taking place, the guests all dressed in evening wear and the boats moored alongside the towpath. It really is an event not to be missed.